On Sundays at CookingManager.Com, I write about appliances and kitchen equipment. This is Part I of a three-part series on food processors. My mother loved gadgets, and her all-time favorite was the food processor. She had three: one meat, one dairy, and one for Passover. She bought me a small one shortly after I graduated college. Some people don’t use their food processor because they don’t like to clean it. But if you think ahead, you can use it half a dozen times or more without washing. Whether you are making a few dishes or one that combines several ingredients, the key is to plan which will go in first. Unless otherwise specified, I’m referring to the S-shaped “butterfly” blade that fits in the bottom of the bowl. Your order should be dry, then wet, then oily. Chop garlic and herbs. Do them all at the beginning in the dry processor bowl, or large pieces will stick to the wet walls. If you will be using it next for vegetables, you probably don’t need to wash it out. A bit of garlic won’t hurt your coleslaw. Vegetables. Start with the ones you want finest (smallest) then add the others. 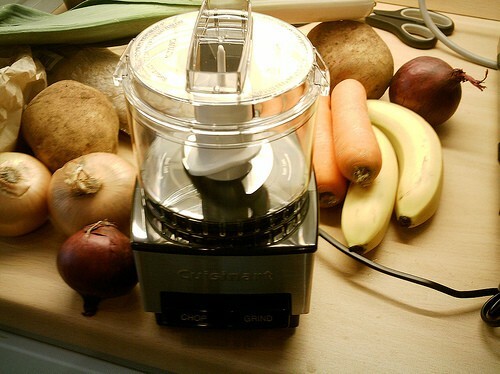 Many vegetables can be chopped all at once, like onions and celery for sautéing. An eggplant salad will be chopped so small that it will practically be mushy. But then you can add the tomatoes, turning the processor on and off once or twice to get chunks. If you want to end up with chunks, the pieces should be cut evenly. Otherwise it doesn’t matter, pieces can be cut in different sizes, but each food processor handles vegetables differently. If your processor is too small for your recipe, chop vegetables in batches and dump them into a bowl. Scrape out the last batch with a spatula, add other ingredients and mix by hand. You can switch blades without emptying the bowl. Start with the steel blade, than carefully remove it and insert the grater or slicer blade as needed. For coleslaw I chop the onion finely with the steel “S’ blade. I remove it carefully, then insert the slicer for the cabbage. Then I switch to the grater for the carrots. Always rinse after processing potatoes. Otherwise they get gray and hard. You don’t need to use soap. Wipe off the machine too. Recipes containing oil, like mayonnaise and cakes, go at the end. Process drier recipes, like yeast cakes, before moist ones. Save chocolate cake for last. When you are finished, put the parts in the dishwasher or wash carefully with detergent. I’ll be writing more about food processors in future posts. I left my beloved 11 cup Cuisinart in the States (sold it to a friend) and am wondering how long I will be able to hold out before buying a new one. Which ones do you like here? We saw a 2 L Braun in Bnei Brak today–much cheaper than the 3 liter Magimix (and half the price of the 2.6 magimix) …thoughts? I read that the better ones have a motor under the bowl and not on the side. When the motor is on the side it requires a belt, which takes more strain. Also, find out what happens with bread dough. Some machines break under the strain, better quality motors turn off until they get cool enough to try again. It depends how much you use it and what for. A bigger bowl does not mean a stronger motor, though, so unless you use it for large cakes and breads the larger size bowl may not be worth it. A new food processor is on my wish list. Right now, all the sales are concentrating on dorm life. So, I will likely replace the microwave and keep waiting. ON: I’ve never had a problem with a Cuisinart or Magimix. Which brand is giving you trouble? In the states I would never buy a Kenwood . Don’t ask, but I ended up buying one here in Jerusalem, a Kenwood Tradition all in one processor (with blender and small chopper) I’m so sorry I spent the money. It seems to work weirdly, after shredding the potatoes with a blade I have to empty it to insert the other blade in order to add the eggs, oil and blend it. Simply cannot find a better way to use it! And the little chopper cannot be used by itself, but only placed inside the larger bowl, but when used the ingred fly out the sides and into the larger bowl! It works like those funny “only in Israel” stories. I cannot resolve myself to keeping it. HELP, PLEASE what other food processors can anyone recommend that work very very well, that can be purchased in Israel? For kugel, Nechama, use the S blade for the potatoes as well. The texture is different but just as good. THe small bowl on my Magimix is also annoying and I don’t use it. But it is still the best out there. Thanks for the tips. I just got a new Cuisinart and am excited to start using it.